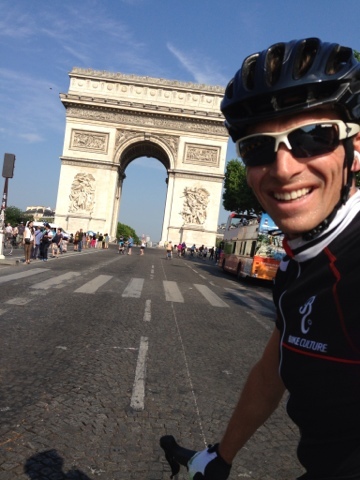 So yesterday I just went for a ride around Paris. 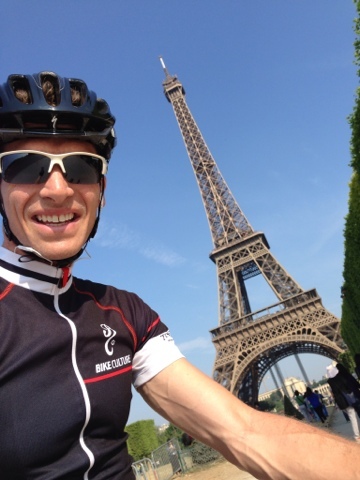 It's not often you can go out on a ride, do 120k and say: "oh yeah, and I saw the start and finish of the final Stage of the 100th Tour de France". In fact, you only ever get to say that once in your lifetime - and it was a great privilege. I meant to go out at about 7.30am but I slept until about 8.30. 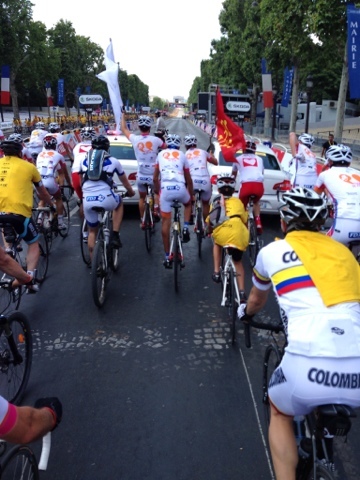 Today was the day to ride the Champs Élysées with around 10,000 others in La Randomee du Tour. My aim was to take off with the lead group and smash it around the 7km pro circuit representing Bike Culture. So I donned the black and white fighting kit and headed out. The Randomee wasn't starting until 2.30pm so the night before I checked bikely.com for a route out of Paris that would cover about 50k as a bit of a warm up and explore. The route took me towards Sens, mostly along the Seine and on B roads so it was pretty nice heading out through the 'burbs. 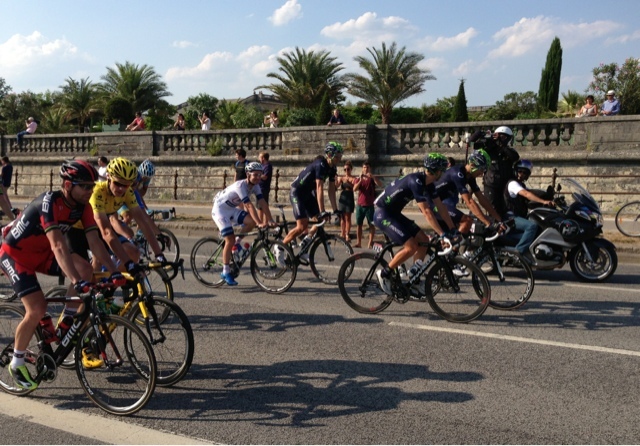 I got about 40k south but then decided to head west to Versailles to see them setting up for the start of the final stage. Since I left late from the apartment, time got the better of me. 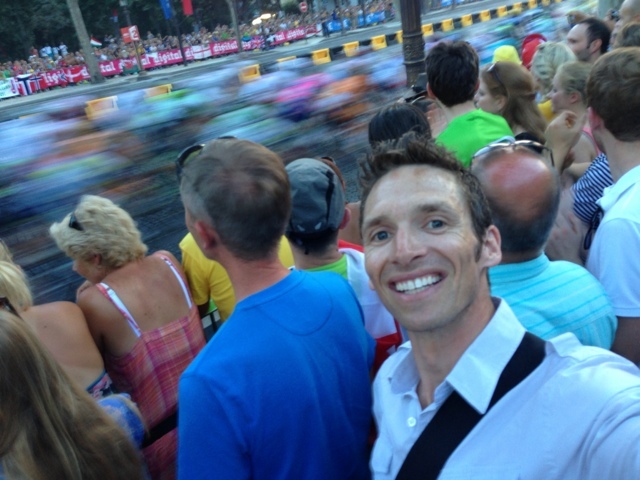 I realised that I better get back to Champs Élysées if I wanted to be on the front of the start grid like T-Bird always taught me. Show your intentions he reckons. 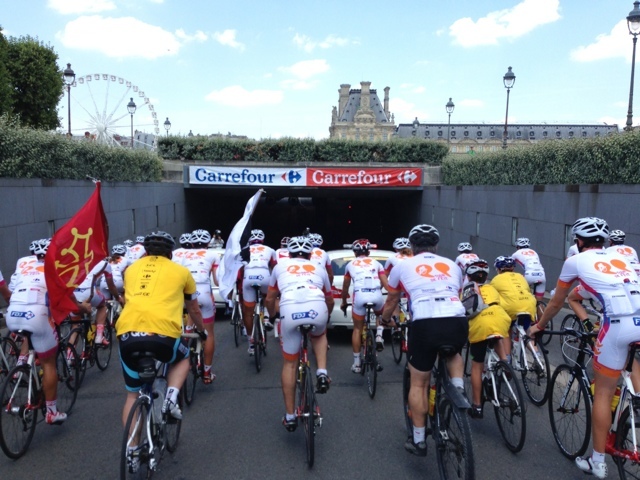 So it was about a 70k loop altogether before getting back to the Champs Élysées. (Garmin was excellent to nav from with openstreetmaps.nl loaded. It indicates every turn to take and recalculated if you miss something. Brilliant for a free download and way more detail than the Garmin Maps that some of the other guys had). It was very cool when I got back into town because 1. they had closed off all the roads to set up and 2. the buzz was building as the crowd took up positions around the circuit. I got to the start of the Randomee about 12 which was two and a half hours before rolling - but if you want pole position...! Whilst waiting, I met another Aussie, Harry, who was more than happy to mind my spot while I ducted off for a Coke, yoghurt and banana - for one cannot "race" on an empty stomach and I'd only stopped for a quick pain chocolat earlier in the day for breakfast. It's very French to ride the drops whilst munching on a chocolate croissant for fuel (apparently). Rego opened at 1pm and being one of the first through allowed me to be right up on the tape. Now the only problem with this early arrival idea, was that I was standing in the middle of a 6 lane asphalt road and it was 37 degrees. 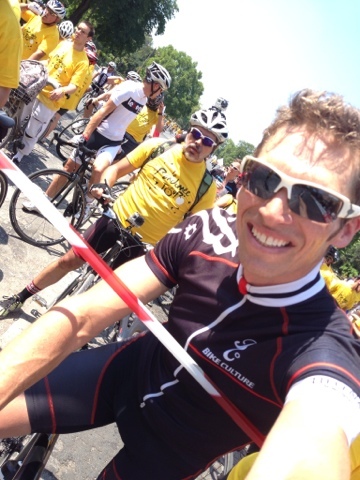 The black BC kit is smart looking as — but it was extremely hot standing there in the boiling sun. On this occasion "pole" position meant actually being shielded from the direct sun by the only street pole and traffic light in the middle of the road, so at least that kept the beaming UV and infrared rays from melting my head. It was a day to be thankful of the 30+ sun cream. So here I am thinking I am right behind the marshalling cars, I'm going to give this a real crack as soon as the flag drops. One lap of pure fury - I will bury myself on the cobbles. Then the corporates arrived and filled in in front of the tape, in front of me, and many of them were on town or mountain bikes and then I realised...there will be no racing. This will be rolling. Damn them corporates who pay the bills *shakes fist*!!! Well it might not be a race for them, but I didn't dress up and wait this long to have my hopes of leading the peleton home on the Champs Élysées dashed. So as soon as the tape dropped and we had the big gee up New Year's style countdown from 10 to 1, I was away. The corporate townies were no match for The Raptor and within the first 50m I was on second wheel behind the cars...and even though my max speed achieved during the lap was 22km/h...it was AWESOME!! Being right on the front, behind the cars, alongside the TV cameras on motorbikes, moto-photographers and a couple of dudes flying flags (who were clearly very decent young racers) was spesh. A couple of the young fellas were taking the piss and kept yelling ATTACK - highly amusing!! So I just soaked it all up. 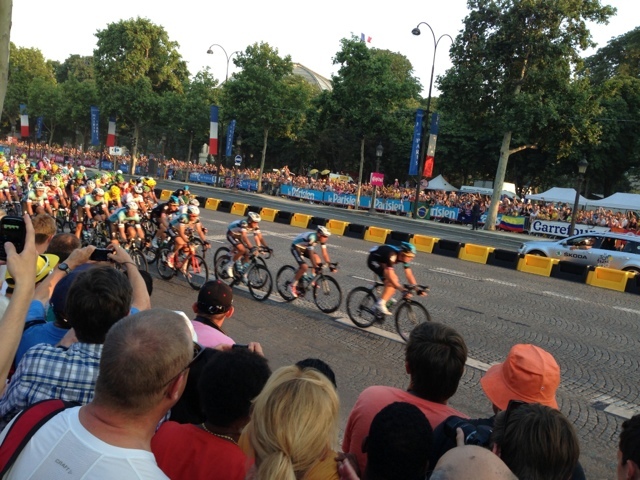 I think the best bit, even more than going under the flame rouge 1km to go kite and the actual finish line on the Champs Élysées, was emerging out of that famous dark tunnel into the blazing sun to massive MCG-esque cheers from the 10 deep crowd on either side of the road. Total rock star moment! 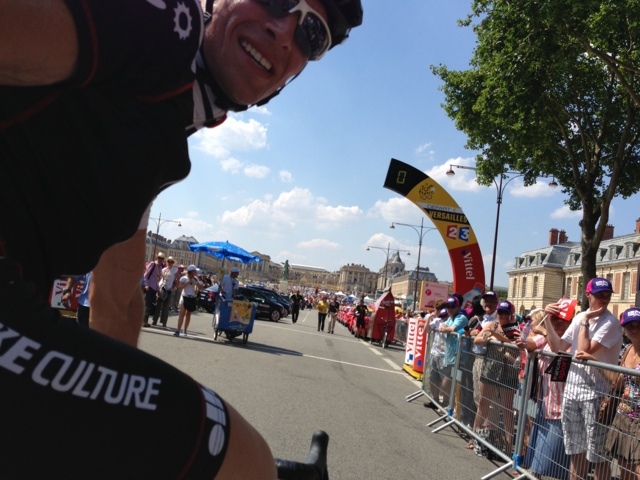 Randomee done I set the Garmin for Versailles. One thing that has amazed me about the Tour is that you can be one street away from all the action and you wouldn't know it wasn't just a boring old Sunday arvo...and then you turn the corner and BANG, the street is packed with cars, bikes, motos, press, the caravan, buses, podiums and merch outlets. In this instance I happened to turn the corner fairly quick, right outside the Versailles Palace and with such pro looking kit on (not to mention matching Raptor), rolled straight up between the barriers without being stopped by security, crowds either side, past the Kilometre Zero banners gaining accidental entry to start area and rode straight through nearly to the team buses before I realised what was going on! Whoops. Then a chap rode up to me fairly quickly and asked me for my access pass in French, to which I replied: "Moi? Pour moi, c'est ne pas possible. Pardon Monsieur." So he asked me to leave. So I did. But not before some punters snapped some shots of this unknown hero who was rolling through the sign on area. 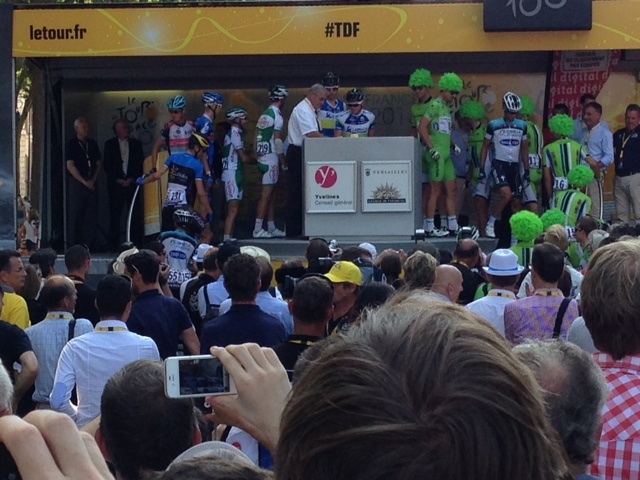 It was pretty tricky getting access to the riders as they signed on - the crowds were big. But I got a few snaps none-the-less. Froomey gives cuddles a few tips as they roll out. After the pro's rolled out in a pretty festival like fashion (as they do on the last day), I turned back for the flat (only about 15k away) and a shower. It was still damn hot and even hotter amongst the massive crowd as I got down to the Champs Élysées and found a spot about 100m past the finish line. Perfect timing as they had just started their second lap and I had a great view of the big screen. They were hooting!! Martin tried real hard, Cadel even had a go, but in the end it came down to the expected bunch sprint: Cav, Greipel & Kittel. 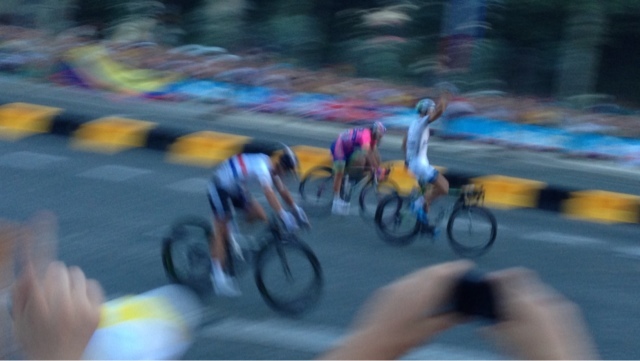 Sagan muffed it and got caught on the front with one turn to go. 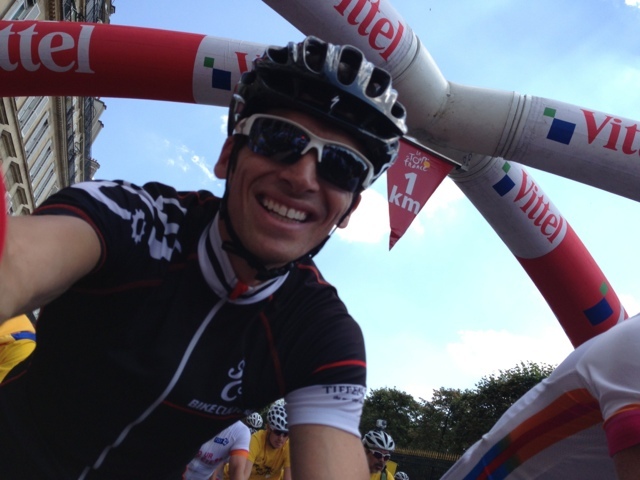 Kittel just too strong with an organised train and a great win. VavaFroome, rolled across the line with nearly his whole team and didn't even make it past us in the throng. I was so tired and foot sore walking home - a big day of standing (over 5 hours) plus 115k on the bike. 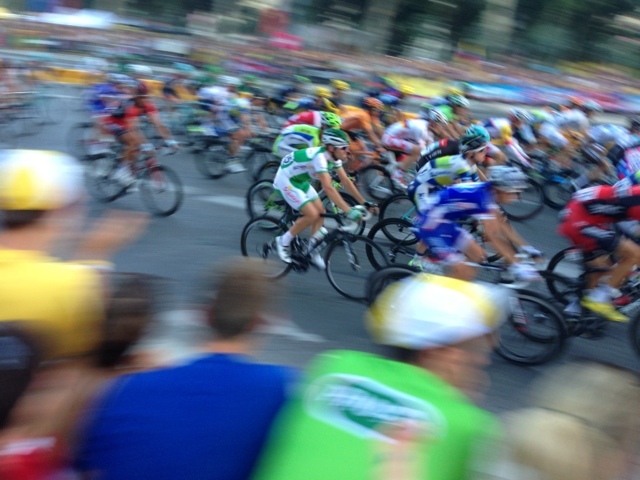 I smashed a chicken sambo and a mineral water (so hungry and thirsty), picked up some TdF merch and headed home for bed. 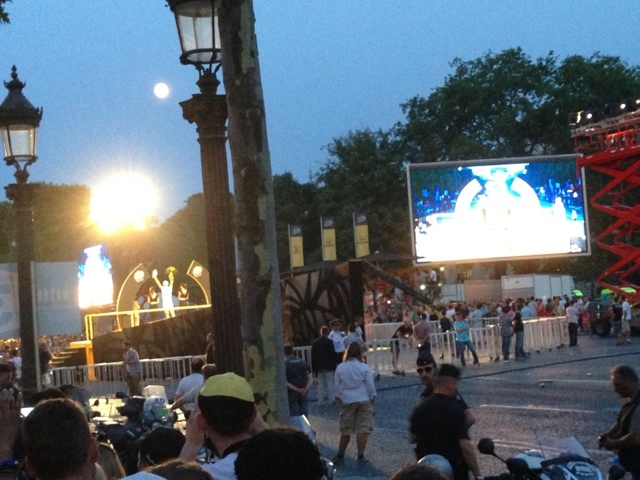 - If you've ever wondered how the TdF is broadcast to the world (look out tech nerds) - this is an excellent explanation.